Do you ever feel like you just want to up-and-go to Italy, relax amidst the picturesque scenery, indulge in vino and inordinate portions of carb-laden pasta? Well, that makes two of us! When life’s daily humdrum inhibits me from leaving on a jet plane, I find inspiration in making a home-cooked meal. Since it’s cloudy & cool where I am, how about some homemade marinara & meatballs to amuse our Italian cuisine craving? The good news—it’s already in the works, and it’s not difficult to do. The dinnervine is no stranger to making meatballs, we’ve previously featured ricotta turkey meatballs, a version of meatball stroganoff, and even balls of meat in a delicious Italian wedding-style soup! 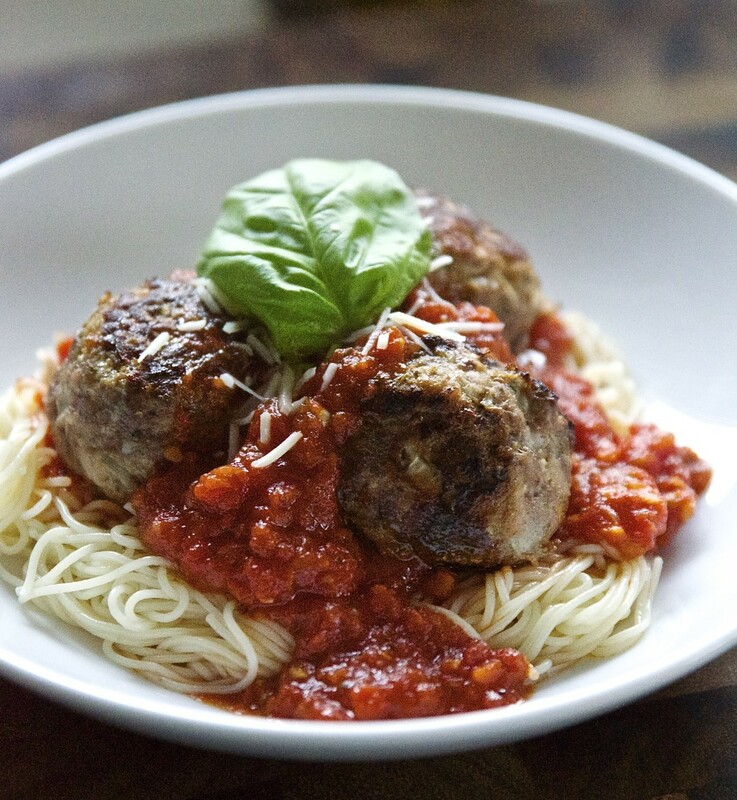 I continually make (alter, improvise, tweak, reinvent) my own recipes as the mood strikes (or because I forgot the right ingredients at the store) and as a result, below my current go-to meatball recipe & a classically simple marinara sauce. Spaghetti & meatball night just got a makeover, can someone please pass the Chianti? . 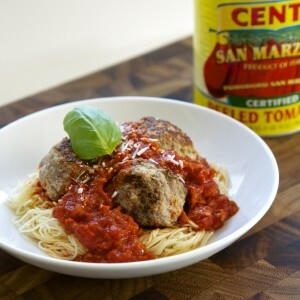 . .
Make dinner Italian one night this week with homemade and flavorful meatballs and a tangy marinara, that is very simple and healthy too! Serve over pasta or eat meatballs and sauce solo. In a large mixing bowl combine: ground meats, diced onion, minced garlic, shredded cheese, Worcestershire, S&P, basil, egg, and bread crumbs, until well combined. By rolling mix firmly with hands, form ~2 inch meatballs until all of mix is gone, set aside on wax paper or surface that can be disinfected (until ready to brown in skillet then bake). Preheat large skillet and heat butter to coat pan, brown meatballs in batches (don't crowd them), on all sides for ~10 mins, once batches are browned transfer to large foil-lined, baking sheet. Once all meatballs are browned & on baking sheet, place in preheated 350 degree oven to finish cooking, ~20 minutes (until cooked through), while they bake, start marinara). In large, enameled cast iron pot (or similar, Dutch Oven), preheat ¼ cup Extra Virgin Olive Oil, and sauté the grated carrots for about 10 minutes to soften, then adding the onion, garlic salt, pepper and ¼ cup wine stirring occasionally until onions are translucent (~5 -8 more mins). To the sautéed mix add contents of the 2 cans of tomatoes, crushing each tomato with hands, as you add them (add all remaining juices in cans to pot as well). Simmer sauce on medium-low uncovered, and add anchovy paste, basil, thyme & oregano. Simmer partially covered on low (very low if sauce starts to 'pop') for at least ½ hour. Swerve sauce over meatballs and pasta of choice, this case angel hair! Garnish with fresh basil & grated parmesan cheese as desired! You can make the meatballs ahead, for a quicker weeknight meal. This makes more meatball servings than sauce servings, so easily double sauce & store for week, or freeze! This makes for excellent leftover meatball sandwiches too! Use some crushed red pepper in the marinara as desired. Sometimes I add and other times not. Add additional salt to your preference, but the meatballs have salt already and our anchovy paste is inherently salty, so I don't add much to sauce. There appears to be a plethora of ingredients for this meal, but many are the same for both the meatballs and the sauce. I prep the onions and garlic for both at one time, and sometimes use my handy-dandy food processor, so my hands don’t smell like garlic for the next 8 days. 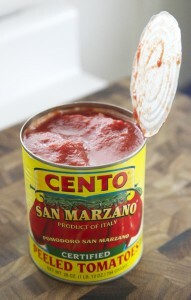 The marinara is simply a base of high quality, canned Italian tomatoes. Specifically, certified San Marzano (the region in Italy where they’re grown). You can find these imported tomatoes at most specialty grocers, though now my local grocery has them too.To jazz up our marinara I add some carrot, which is an easy way to naturally sweeten the sauce and hey, a colorful vegetable can’t hurt right? You won’t distinctly taste them however, and it’s best to finely chop/grate them so they’re not crunchy. Now, I am NOT a fan of anchovies, no, but I learned a little Italian secret from my very non-Italian Mom, who learned it from someone else’s very Italian Mom. That means it’s totally authentic! Since I cannot stand the mere sight of the little fish, I use packaged anchovy paste, available in my local grocery (I find a tube next to to garlic & sun-dried tomato pastes in the vinegar/condiment isle, picture in slide show above). It adds that little something (a saltiness & zest) to our sauce that really works (don’t worry, it doesn’t taste at all like seafood, I promise). I just plain LOVE this meal, any day, anytime, with any pasta! Okay, I’m getting a little worked-up since I’m hungry, but truthfully, it’s a keeper. Nothing beats homemade meatballs, and if you don’t fancy the four-legged proteins, then ground turkey works also (just make sure to get some with a little fat, or they can turn out on the dry side). I always make extra, because the leftovers are almost better! If you’re stuck state-side like I am, then I hope you at least get to enjoy a great Italian meal at home, Buona sera!